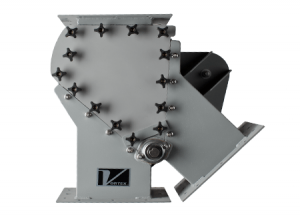 Gates & Diverters | Phenix Equipment Inc. 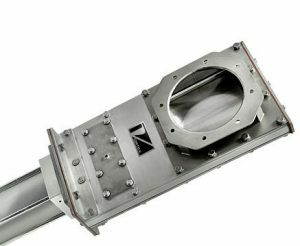 Ideal for handling dry bulk material in gravity flow, dilute phase or dense phase pneumatic conveying applications. 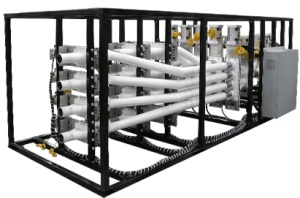 Vortex slide gates are designed and engineered with two main principals in mind: 1. extend the service life of the valve and 2. perform maintenance without taking the valve out of line. Vortex valves serve many industries including chemical, cement, coal, food, frac sand, grain, minerals, petrochemical, pharmaceutical, plastics, polymer, rubber, and mining. 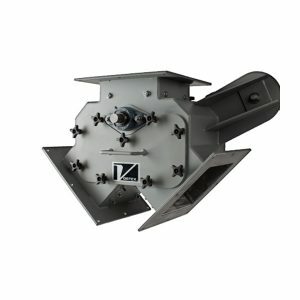 The Vortex® Quantum Orifice Gate™ is specifically engineered to handle dry bulk solids in gravity flow, dilute phase, or vacuum conveying systems with pressures up to 15 psig (1 barg) depending on size. Traditional slide gates and butterfly valves commonly allow packing of material, which prevents positive air and material shutoff. 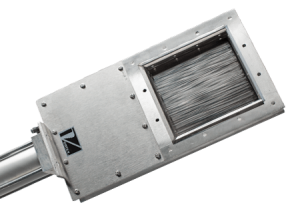 The Vortex® Roller Gate™ is the best choice for handling dry material in gravity flow or low-pressure applications. This gate is available in a wide variety of configurations including rectangular sizes and customer specific hole patterns. It has live-loaded seals that extend the service life by compensating for wear. These seals provide an excellent material seal across the gate and to atmosphere. They can also be replaced while the valve is in-line. 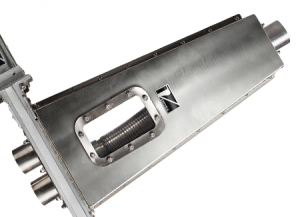 Similar slide gates have seals made of soft packing, rubber or felt, which rapidly erode away allowing product leakage. 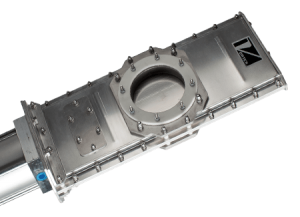 The Titan Pressure Valve is designed to address higher-pressure applications up to 100 psig (6.8 barg) and higher temperatures up to 660° F (350° C). 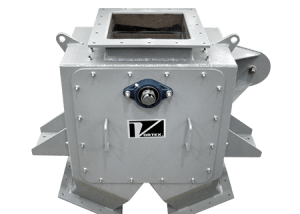 The TPV Gate is engineered for highly abrasive applications and requires minimal maintenance over the life of the valve. 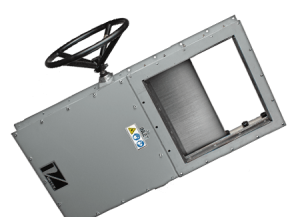 Featuring Vortex’s rising-blade technology, the TPV Gate ensures an optimal seal and positive material shutoff with the use of lifting lugs. 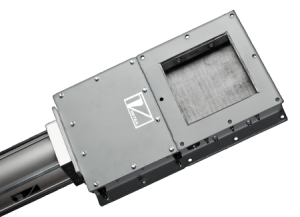 This prevents the blade from jamming or packing material upon closure, which can cause serious downtime. 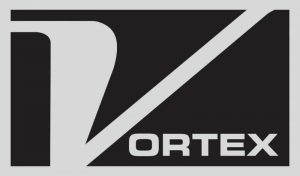 Unlike most knife gates, the Vortex TPV contains a replaceable seat that can significantly increase the life of the valve. 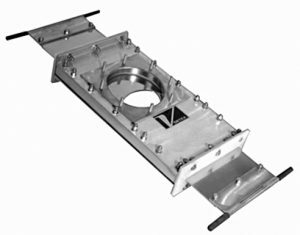 The Vortex® Clear Action Gate™ is designed for use in gravity flow or pneumatic conveying systems up to 15 psig (1 barg) depending on size. 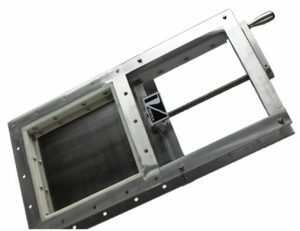 Mounted horizontally, the machined square-edged blade of this gate mechanically clears the material from the sealing surfaces on each closing cycle allowing it to discharge beneath the valve. 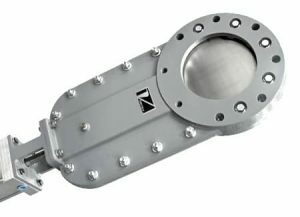 Open cavities where material collects in traditional gate valves have been eliminated with the square blade and seal design. 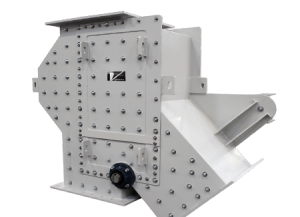 The Vortex® Aggregate Gate™ is designed to meet demanding applications handling material such as sand, gravel, whole grains, and coal. The narrow profile, choice of actuators, and custom rectangular sizes make this slide gate adaptable to most existing installations. 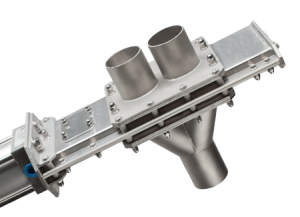 Optional inlet or outlet flanges and dust return pans are available. 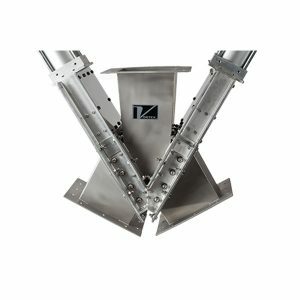 The Vortex® Hand Slide Orifice Gate™ is designed specifically to handle dry bulk solids in gravity flow conveying. A full flow orifice provides unrestricted conveying of material with no disk or ledges to impede flow or cause material bridging. The gate seat and live-loaded seals are protected from material flow by a metal insert. By design, the valve “self cleans” material from the seat on each stroke of the valve blade improving overall seat life. 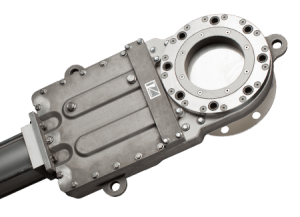 The Vortex® Quick Clean Orifice Gate™ is a “clean out of place” gate valve designed for frequent cleaning. 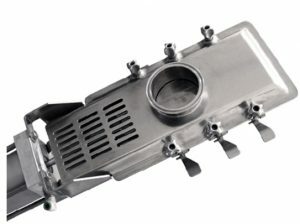 The valve features a full-port opening and self-cleaning design. It can be disassembled and assembled in minutes without tools. The valve carries a USDA Dairy Standard Accepted rating and is an excellent choice for sanitary applications. 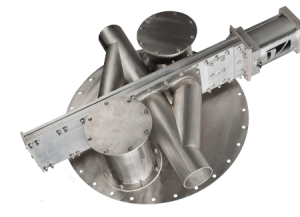 Ideal for handling dry bulk material in gravity flow, dilute phase or dense phase pneumatic conveying applications. 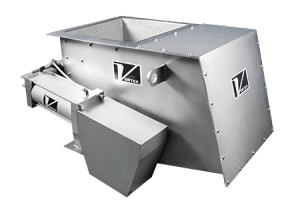 Vortex diverters are designed and engineered with two main principals in mind: 1. extend the service life of the valve and 2. perform maintenance without taking the valve out of line. Vortex valves serve many industries including chemical, cement, coal, food, frac sand, grain, minerals, petrochemical, pharmaceutical, plastics, polymer, rubber, and mining.